After a long week in bed, it was so nice to be back in the classroom again with the second graders. Today started off with a Calendar lesson, something new for me to see. 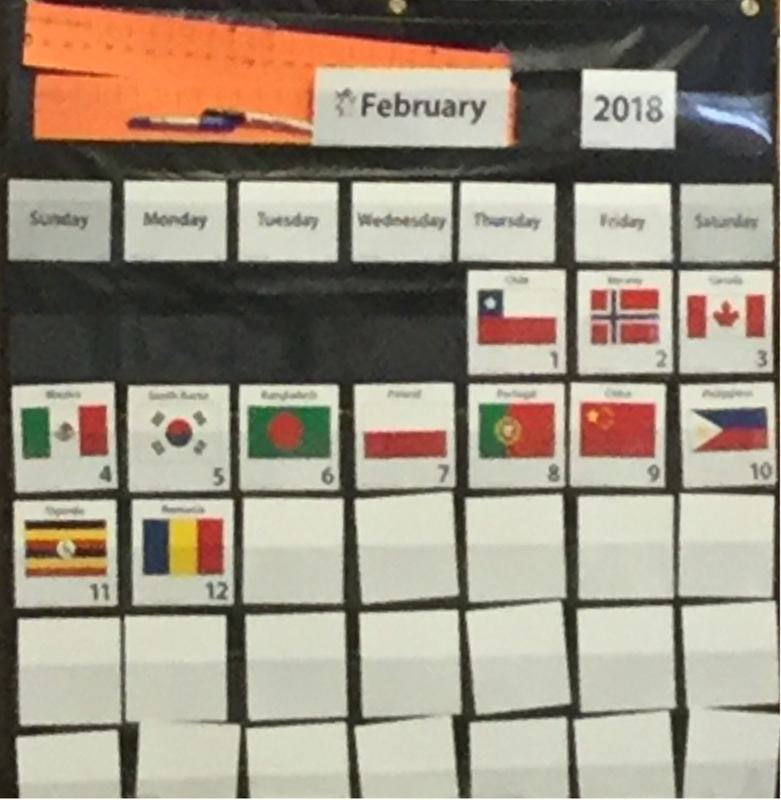 My CT had the students focus on the back of the room to see the calendar. 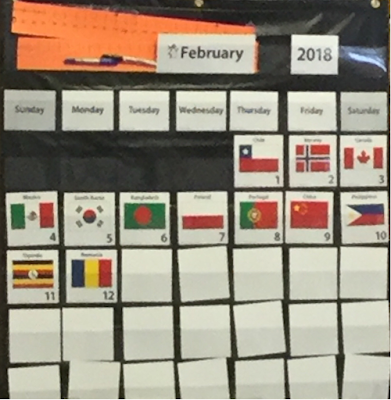 Each day of the month is a flag from around the world. As my CT flipped over the 10th, 11th & 12th, she had the students describe the flags and explain any patterns they may see. After noticing that all of the flags had red in them, she asked them how they looked like fractions. Students began to see that Poland, Uganda, Canada, and Romania had fraction qualities. My CT led them through a number of questions so that they would come up with numbers like: one-half, one third, two-fifths, etc. This was a great lesson to find math in our everyday world and tie in a quick discussion about the Olympics. I like how quick and easy it was and still be an incredible learning experience for the entire class. 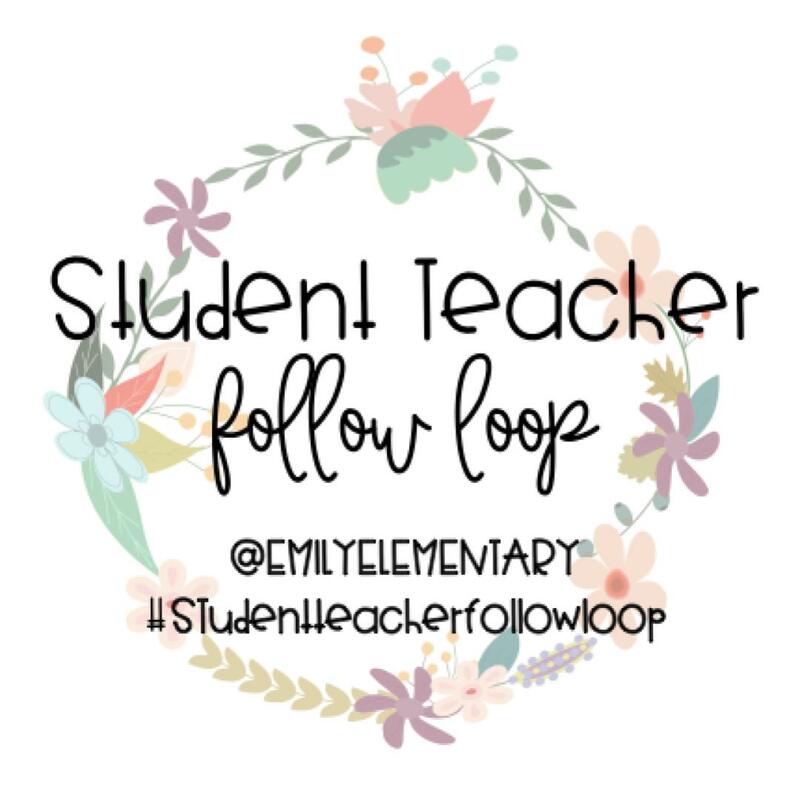 The questions and the mini-stories my CT shared engaged the students and allowed them to actively learn something new; as well as apply something already known. I think it's great when a teacher can teach without the students really knowing that they are being taught. While observing this mini-lesson, I couldn't help but think of The Big Bang Theory, Fun with Flag video series Amy Farrah Fowler & Sheldon completed on the show. After the mini lesson, my CT had a few extra moments before taking the students to block. She used this time wisely to read from the chapter book The City of Ember. During block, my CT used this time for grading papers and restoring her energy. She is under the weather the last few days. In addition, it was snowing today so the students were a bit antsy having to stay inside as they watched the snowfall. I can imagine it was difficult to compete with on a Monday. I believe, sometimes you cannot compete, maybe you need to give in a little and be flexible on the days plan. How can you incorporate what is happening outside to what you are doing inside, so that it not too much of a distraction? During Response to Intervention (RTI), students read a lesson on Dinosaurs from their Science book and my CT asked them questions individually as they finished. If completed their questions correctly they were given a handout to extend the knowledge they just read, if they did not they were instructed to go back and read so they can come back and answer correctly. This was a good way to assess students comprehension; using various levels of DOK questioning. I really like how she uses different subjects integrated in RTI, reading, math, and writing. There is so much that needs to be covered and learned, it is important to add in additional learning moments as you can. During the last teaching moments of the day, students worked on their Google Slides presentation on Volcanoes, Tsunamis, and Earthquakes. As the students worked individually, I walked around and assisted the students with their questions about creating slides. 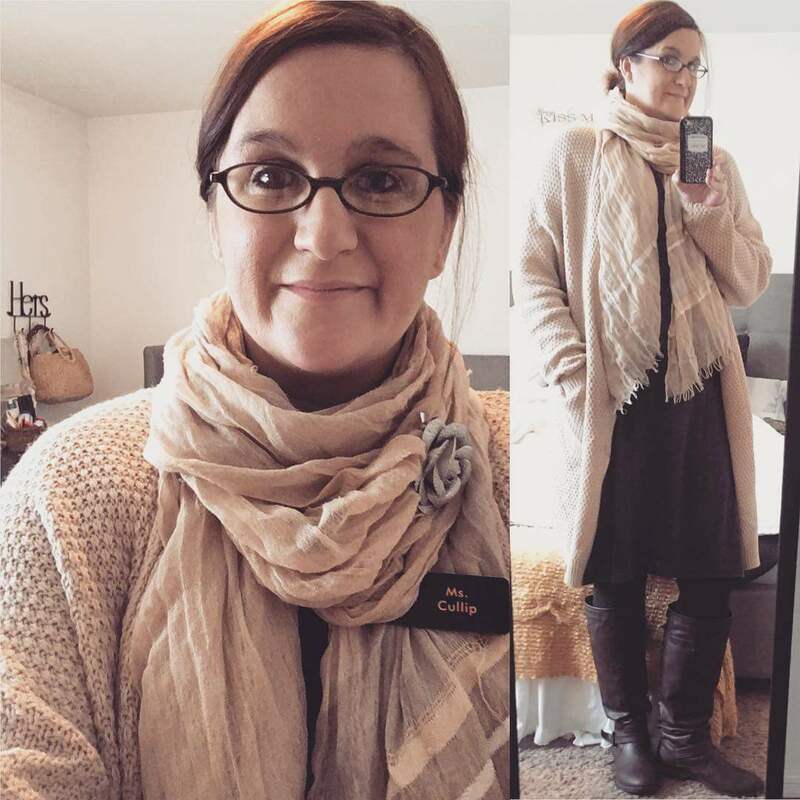 Sizing pictures, adding text, searching for pictures, etc. As the spelling questions came up, I turned to write them on the whiteboard so students could find the common ones needed to complete their slides. The students were very excited to show me what they did last week, while I was gone. They worked really hard on using the knowledge they learned in readings, discussions, and videos. One student even found a picture of Mount St. Helens from the story I told them two weeks ago!